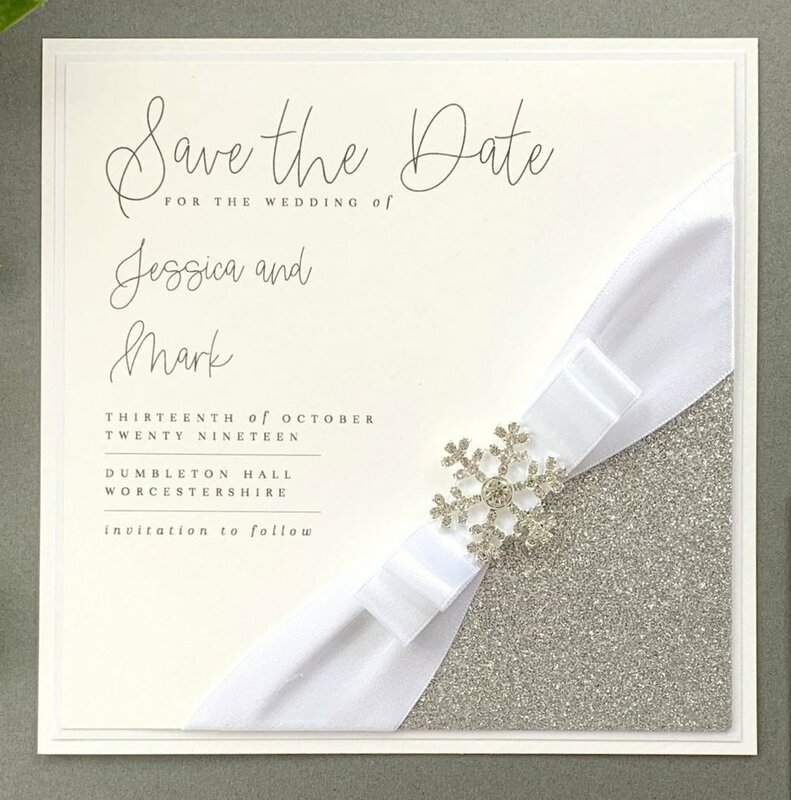 A design made to sparkle, our Leto collection is equally at home for a stunning winter wedding, or going full glitz and glam for an Art Deco style. 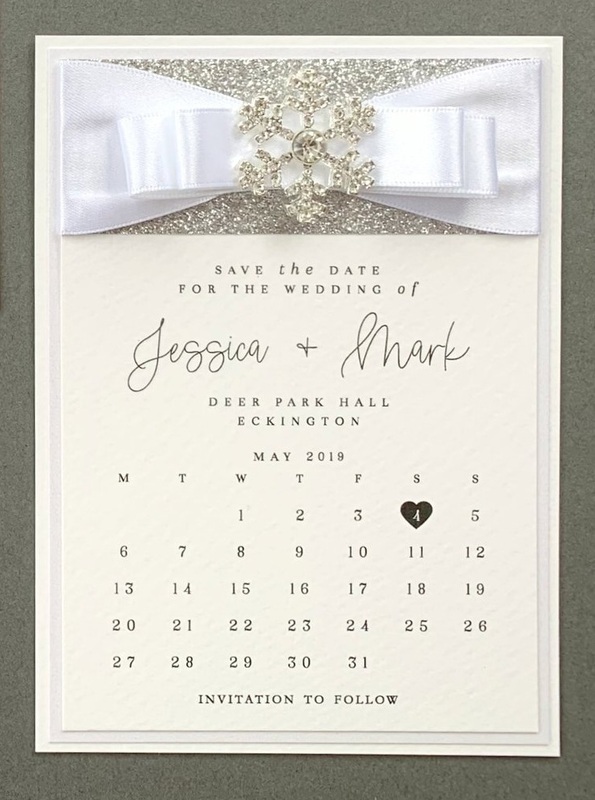 The design of this Save The Date uses an elegant, luxurious design, combining a choice of diamante and pearl embellishments, dazzling glitter paper, and satin ribbon alongside lovely modern typography. We exclusively use Berisford and Satab ribbons for our fully-handmade collections, with a huge amount of colour choices on offer and a non-fray, double-sided finish. For this design we use both 35mm and 15mm ribbon together and the pictured examples use “White”. The choice of colours available can be seen by clicking below. All embellishments are shown below in their respective price bands - as standard Leto comes priced with a “Band A” embellishment which can be upgraded to an alternative, such as the pictured “Diamante Snow Large” which is in Price Band E. Upgrade pricing is shown at the foot of this page. Leto is provided as standard with a white base layer. The “matting” can be coloured as standard, which is the layer that sits between the base and the top. We’ve used “White Pearlescent” in the pictured examples. Click on the link below to see the options for the standard coloured matting layer, plus the choice for upgrading the base colour. Upgrade pricing is shown at the foot of this page. One of Leto’s key features is the use of glitter paper. This paper really catches the light for a sparkling finish, so whether it’s a wedding for a winter wonderland, or something glitzy and glamorous for a 1920’s style, there’ll be a shade to suit, such as the pictured “Starbright Silver”. Click below to see the shades currently on offer. 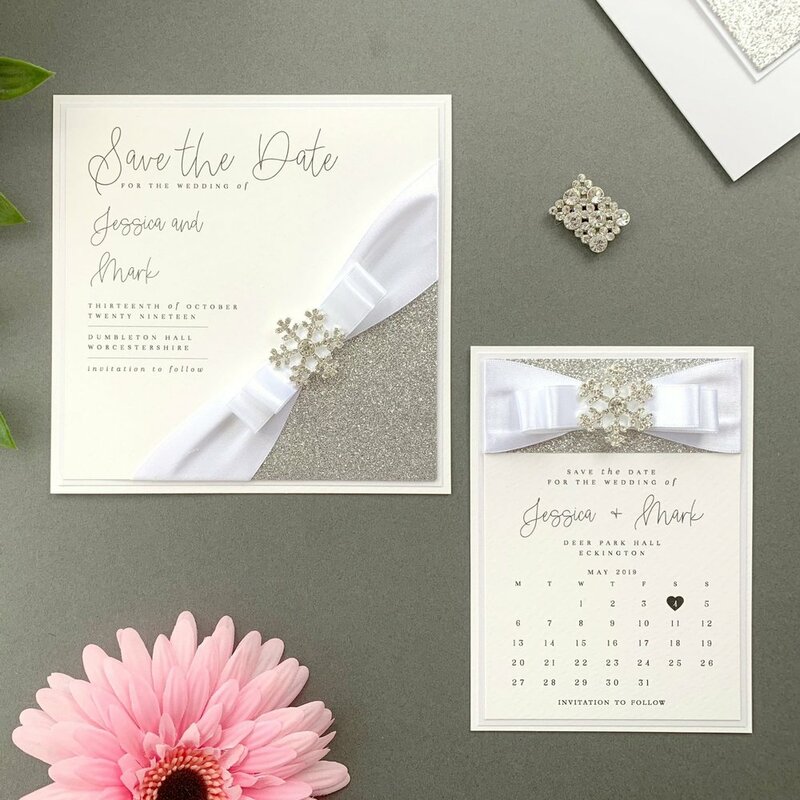 Our Leto collection uses layers of Italian textured cardstock for its design alongside double-sided satin ribbon, a choice of embellishments and glitter paper.